Throughout the 1970s, conductor and composer Leonard Bernstein was invited to lead the greatest orchestras of the world in a number of concerts that since such time have become legendary. Now, these historic performances are available on DVD for the first time. See Leonard Bernstein conduct thrilling masterpieces on his world tours with The New York Philharmonic and with The London Symphony Orchestra, The National Orchestra of France, The Vienna Philharmonic and The Israel Philharmonic Orchestra. 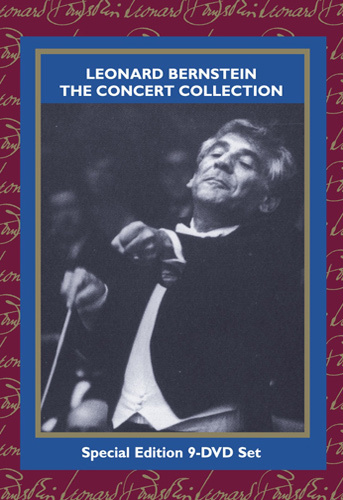 This thrilling concert collection also contains Leonard Bernstein's acclaimed documentary portrait of Beethoven prepared for the 200th birthday celebration in Vienna, as well as a full-length performance of Leonard Bernstein's opera, Trouble in Tahiti. This is a 9-DVD Set!!! "Leonard Bernstein was famous for making the great works of classical music accessible, such as through his Young People's Concerts programs. 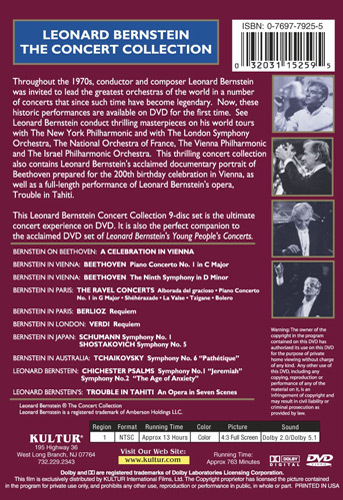 This set of nine concerts conducted by Bernstein during the 1970s continues that effort to bring great music into the home. And what great music it is: there's much that's familiar, some that's not, and all of it's quite terrific and performed with Bernstein's trademark panache that's fun to watch in and of itself...this is a collection of great performances of timeless classics. Very highly recommended."